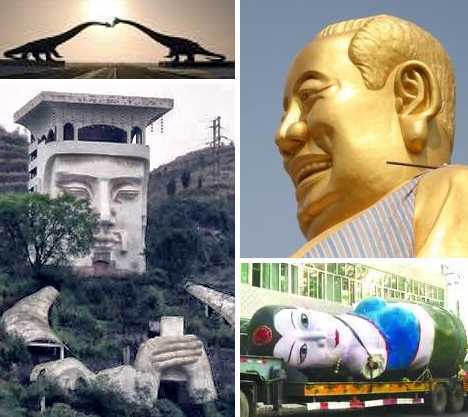 These 9 Chinese statues are so awful, many were demolished within days of their unveiling after enduring scorn and ridicule by the People’s Republic’s people. 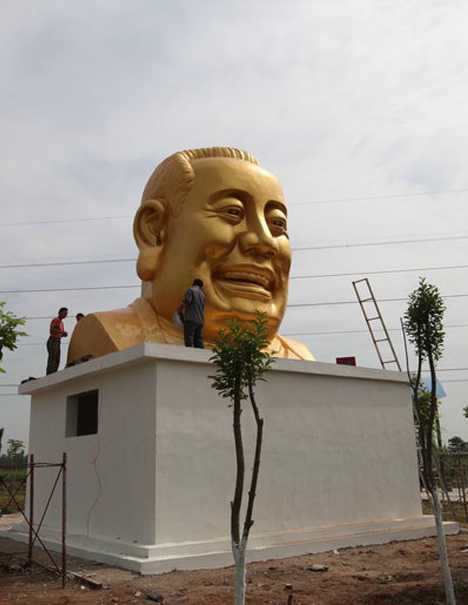 In April of 2013, citizens of Luoyang in east-central China’s Henan province were excited about the soon-to-open Hualong Amusement Park with an enormous gold-toned Buddha statue at its heart. 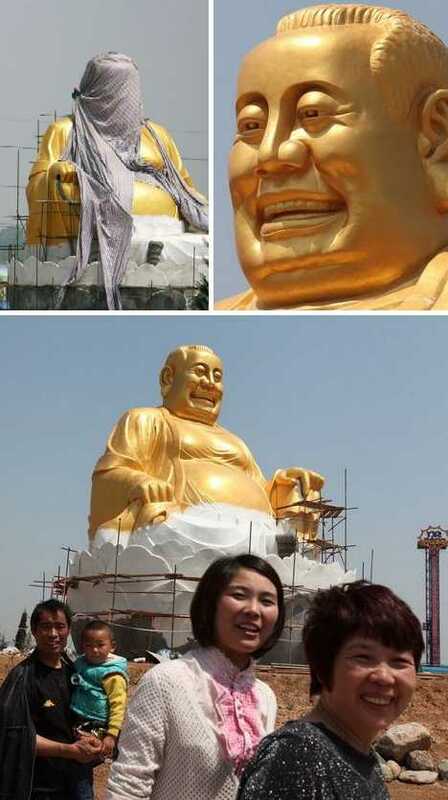 Imagine the shocked silence when the covers came off the statue, revealing what incredulous netizens quickly dubbed the “Big Maitreya with the Swept-back Hairstyle.” When pressed, park managers admitted the statue’s head was modeled after a local entrepreneur who believed his grinning golden visage would help “inspire young people.” Inspire them to commit arson, one would guess. After a few days of scathing and unrelenting criticism from local web commentators, park visitors arrived to find the statue headless – odd, yes, but still an improvement. As for the missing head, it turned up shortly thereafter mounted on a small, nondescript building some likened to a public restroom, presumably so young people would be inspired to answer nature’s call in a more entrepreneurial manner. Want to know where the money you spend at Walmart is going? Try Inner Mongolia, where white elephants and green dinosaurs (in this case, one and the same) are free to roam. Unlike other constructed-but-unoccupied cities in the area, Erenhot boasts a population of about 75,000 and a thriving wind farm but city managers felt something was missing. Solution: build a Dinosaur Town & Tea Road Park, plunk a flock of life-sized dinosaur statues around the wind farm to make it look more natural, and have two of the biggest beasts kiss as they arch their necks over a highway… because dinosaurs DID kiss, of course. Wiiiilmaaa! So Long Soong Ching-ling, we hardly knew you or at least, knew your statue! Soong Ching-ling was the second wife of Sun Yat-sen, founding father of the Republic of China, and is held in high regard by all Chinese to this day. 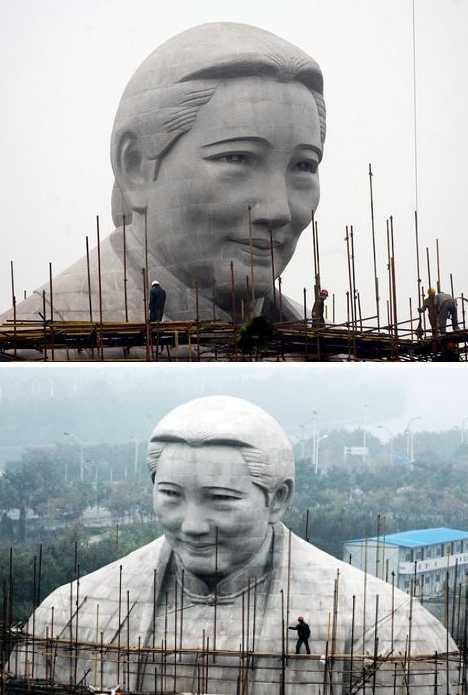 Therefore it was no surprise the Henan province Soong Ching-ling Foundation was able to scrape up 120 million yuan ($19.5 million) to construct a 24 meter (78.5 ft) tall statue honoring her in Henan’s capital city of Zhengzhou. 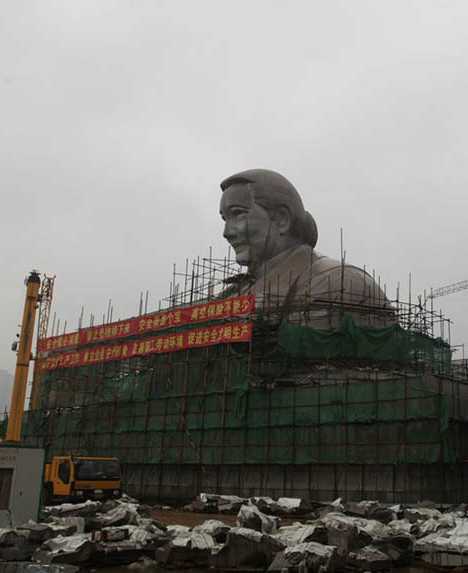 What WAS surprising was that the statue was demolished before it was even half-finished. Sun, I am disappoint. Curiously, it seems that managers at the Henan Provincial Soong Ching Ling Foundation took issue with the appearance of the statue, which was supposed to have been based on a design by Professor Liang Mingcheng of the Guangzhou Academy of Fine Arts. “Though the statue and our design look alike, it is terrible in both effect and quality,” stated (or rather, spun) Professor Liang, who evidently isn’t one to mince words. End result: mince the statue.